I think I started by reading Don DeLillo’s White Noise and then Conrad’s Heart of Darkness. And then I became a little bit more systematic and made a list of classics and started going through them. But anyway, from that point up until now I’ve read about 750 books, and I doubt that even 40 of them were SFF novels. It just didn’t make sense to me to read more science fiction and fantasy. Anyway, the shift in reading habits was purposeful, but it was also, slowly, accompanied by a shift in tastes. I lost interest in fiction involving violence and combat and heroism. Even if the novel is incredibly sophisticated and well-written, I find it difficult to get excited about someone saving the world. Honestly, even literary war novels (the Catch-22s, the War and Peaces, etc.) don’t excite me that often (although there are many that I’ve read and enjoyed). War is such a tiny part of modern life (and growing tinier every day, according to statistics!) and it feels like we devote a disproportionate amount of attention to it. Recently I’ve been reading a lot of young adult fiction. I started by reading mostly contemporary YA, but I’ve started to get a little bit into the (massive amount of) SFF YA as well. And I still do have that resistance. The Hunger Games is one of the more sophisticated exploration of the “Teen-As-Savior” trope: it’s clear that Katniss isn’t really the savior because of her combat prowess or personal charisma; it’s because she’s a symbol. To me, that seems a bit truer to life than the Harry Potter model of the teen who goes out and actually defeats the primary antagonist. The latter has no real life analogues, but the former does have a few: Joan of Arc; the Tunisian martyr, Mohamed Bouazizi, who kicked off the Arab Spring; and (as someone noted on my Facebook) Gavrilo Princip. But even there, it still doesn’t stick well with me: I cannot believe in a world where one person can have so much importance. Despite my inability to suspend disbelief, I have found myself enjoying these novels. I read the first Hunger Games book over a year ago (maybe two years ago?) and held off on reading the second. But after reading the first few pages of a dozen books, it was Catching Fire that ended up drawing me in. I read it in four hours straight. It’s a gripping book. I absolutely see why it’s become a best-seller. It’s not something that you can break down in simple terms, but the book does have a kind of charisma. However, I have given myself permission to skim the fight scenes. Fight scenes strike me as a bit pointless. They’re all just bodies being moved around and fitted together like pieces on a gameboard. I can usually manage to grasp whatever is the clever thing that the fighter is doing, but as for the specifics: who is punching who and who is getting wounded and who got an arrow in the face…I just let it elude me. And it doesn’t really seem to harm my comprehension of the book much at all. I do the same thing when reading Dickens. Actually, I give Dickens a little more credit: I assume that when I can’t understand something in Dickens, it’s because it’s meant to be incomprehensible. Before, [during Crackpot Hall’s time of glory,] when you entered a room, the lights flickered on and the fire rose up to greet you. Before, when you reached for a towel, it was clean and fluffy and smelled of lemony sunshine. Before, delicious dinners appeared on command and dirty dishes disappeared. Before, rooms shifted with your desire, so it was only ever a short step away to the potty, and you had dozens of potties to choose from. Now, all gone. That’s the truth about Crackpot Hall. For a prose work, this paragraph displays an unusual amount of attention to sound. For instance, look at the parallel structure and alliteration of “flickered on and fire rose up.” Or the similar penultimate ‘n’s in “lemony” and “sunshine.” Or the alliteration of “delicious dinners” and “dirty dishes disappeared”. Or how “Crackpot Hall” is repeated at the end of the paragraph to echo its use in the beginning. Or how “Now, all gone.” is a very short sentence after quite a long sentence. Anyway, this example is from a not particularly special paragraph. Any paragraph of the book would reward this kind of acoustical examination. And it’s really fun to read. But I still found myself skimming the fight scenes. 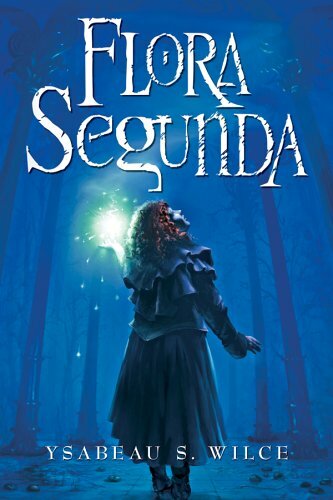 *Other fun parts of Flora Segunda: the author lives in San Francisco, and the book’s geography and place names are obviously based on the city’s.